November 2016 saw TG Judo club being awarded clubmark status by UK Sport and Sport England. The full article on the clubs achievements can be found on the British Judo associations website HERE! Open day for 180 St-Michaels pupils. 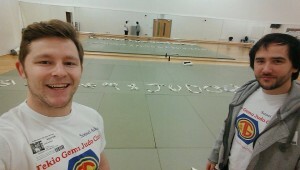 February 4th 2016 saw the second open day at St-Michaels school at which 180 year 7 pupils received a trial Judo class delivered by Sensei’s Adam and Neal. After this open day more than 20 students went on to attend a class at Tekio Gemu Judo club outside of School meaning those that persist with Judo will gain the many benefits associated with such a unified and organised Olympic sport. Neal and Adam will be preforming another open day to another 180 pupils in the summer term to aid another of St-Michaels schools development days.